Gangtok, 27 Feb (IPR): With barely three months left for General Elections, today as per direction of Election Commission of India, EVM VVPAT Units have been shifted from East District warehouse located at CEO office, Gangtok to West district, South district and North district EVM VVPAT warehouses. The Strong Room was opened with the permission of ADC East (Hq), Mr. J.C. Namgyal, who is also the Nodal Officer for EVM VVPAT Management for East district. The Nodal Officers for EVM VVPAT Management of the districts, SDM Mangan, Mr. Samdup Bhutia, SDM Yangyang, Mr. Tshering Gyatso Bhutia, DFO West, Mr. Tenzing Norbu Bhutia and officers and IT staffs of the office of the CEO, Sikkim were also present. Members from political parties Mr. Raj Kumar (SDF) CEC Member, Mr. Krishna Sharma (SKM) Vice President East District also witnessed the opening of the warehouse and shifting of EVM VVPAT Units. All the activities of EVMs and VVPATs are now monitored by EVMS (EVM Management System). The New EVM Management System has two components, first is the Web based application and second is a Mobile application. The Web Based Application has core functionalities related to EVM management process used by users like Manufacture, ECI, CEOs, DEOs and Warehouse in charge, whereas the Mobile Application supports application used by temporary users mainly for scanning at warehouse level during sending and receiving in AC Strong Room after first randomization. 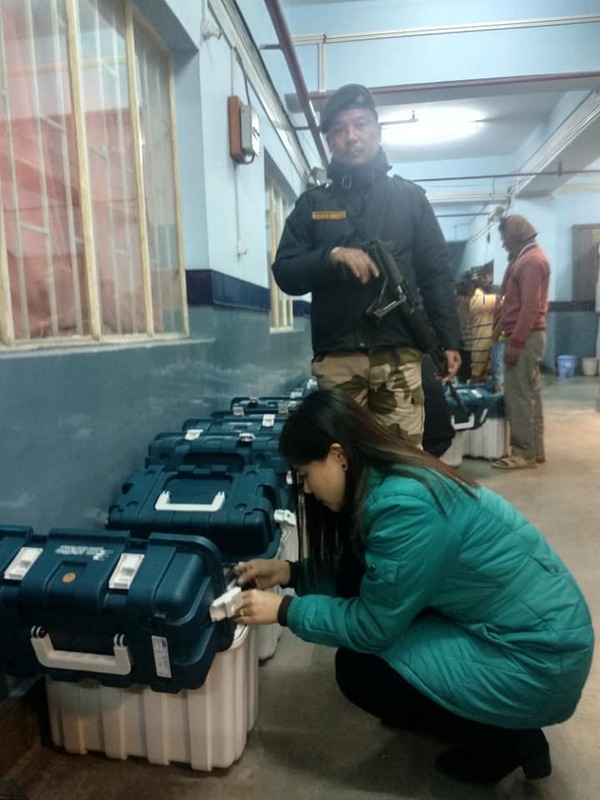 The total number of EVM Units shifted to South District is 112 (BU), 115 (CU) and 161 VVPATs, followed by 41 (BU) 46 (CU) and 54 VVPATs to North District and 82 (BU), 87(CU) and 78 VVPATs to West District respectively. All the EVM VVPAT Units are collected by Executive Magistrate from the respective district concerned. A tracking device has been installed in the vehicle carrying EVM Units as per the norms of Election Commission Of India to monitor and keep track of EVM Units during the transit which is monitored by DEOs and CEO Office. Strict SOP for security is also being followed . The vehicle is being accompanied by armed guards and executive magistrates throughout the transit. 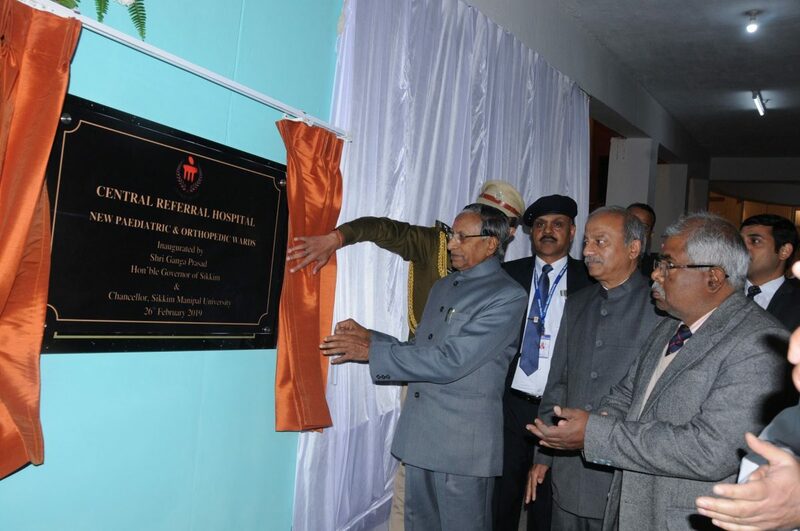 Gangtok, 26 Feb (IPR): Hon’ble Governor, Shri Ganga Prasad, inaugurated new Paediatric and Orthopaedic wards of Central Referral Hospital (CRH), Manipal in Tadong today in the presence of Chief Secretary, Shri A.K. Shrivastava, Vice Chancellor of Sikkim Manipal University (SMU), Lieutenant General (retired), Dr. M.D. Venkatesh, and host of other dignitaries. The Governor congratulated SMU for infrastructural development in the health sector in the State. The Governor and other dignitaries took a round of the Paediatric ward, Orthopaedic ward and Nursing Skills Laboratory. 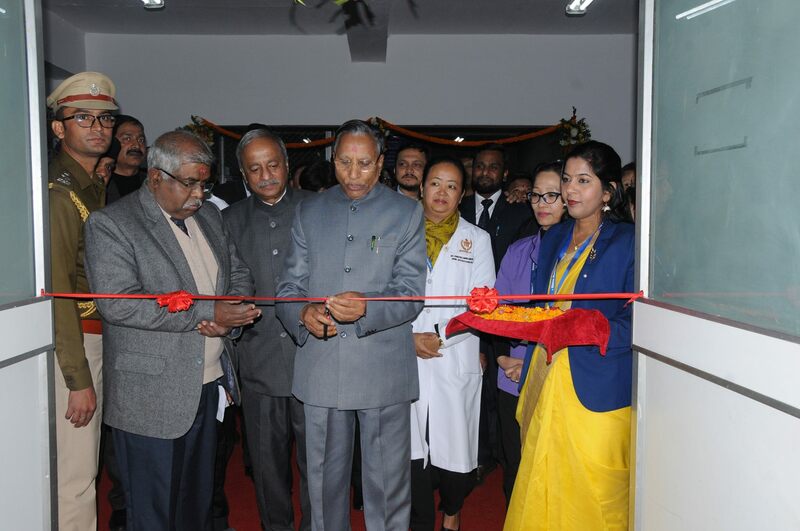 After inaugurating Pediatric and Ortho ward of CRH, the Governor interacted with the students of Sikkim Manipal Institute of Medical Sciences. Addressing the students, the Governor said that over a period of two and half decades, tremendous progress has been made by the SMIMS in health care and academic sector. SMIMS has given an opportunity for everyone to chase their dream and aspiration, he said, urging the students to make the most of it. The Governor opined that it was important to empower the young minds with knowledge, but however stated that they should not be self-centred but should give back to the society once students achieve their goals. He added that the goal of education should be to strengthen and develop the society at large. Urging the students to make best use of time in several career options available before them, Shri Prasad said that students should not confine to only educational knowledge. “You have all the qualities and the spirit to excel so therefore you must keep your spirit alive throughout your life. Institution provides you wide range of opportunities and unique experiences to develop leadership and life skills and I am sure this will be exciting journey for learning and growth for all of you,” the Governor added. Earlier, the Governor interacted with the students and answered several of their queries. Chief Secretary, Shri A.K. Shrivastava, in his address urged the students to keep themselves away from substance abuse which is one of the major menaces in the modern day. Speaking about present day ills like suicide and depression, the CS urged the students to avoid jumping into conclusion immediately and motivated them to make their own assessment in an intelligent way. Earlier, Vice Chancellor, SMU, Dr. M.D. Venkatesh, in his welcome address gave brief glimpses of the journey of SMU in order to provide better health care services in the State. Gyalshing, 26 Feb (IPR): On the last working day of District Collector, West, Dr. A.B. Karki, felicitated three students who were adjudged as Best Essay Writers in the Inter Sub-division School Essay Competition which was recently conducted by the Human Resource Development Department at the Subdivisional level. A sum of Rs. 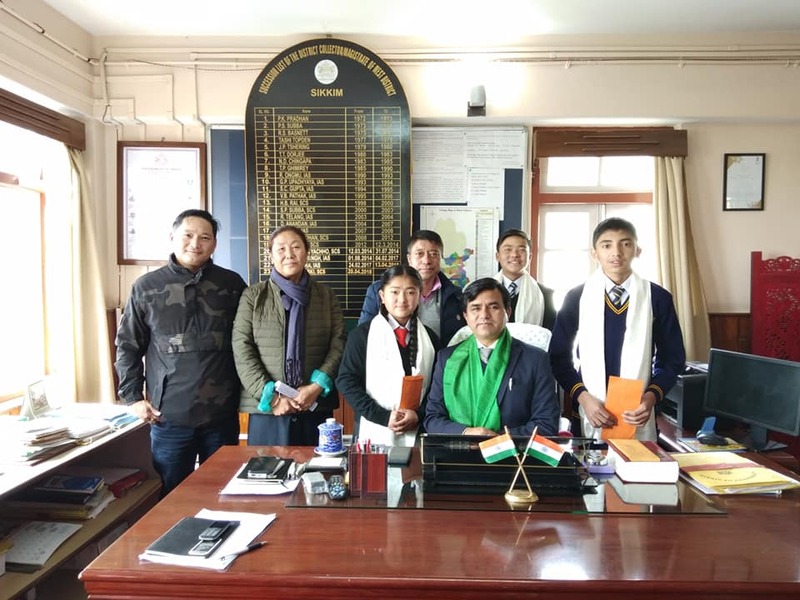 5000/- to three best essay writers from three Sub Divisions were handed over by the DC in the presence of Additional DC, West, Shri Karma L. Lepcha, Additional Director, HRDD, Smt T. Eden Bhutia, and Sub Divisional Magistrate, Yuksam, Dr. Sonam R. Lepcha. 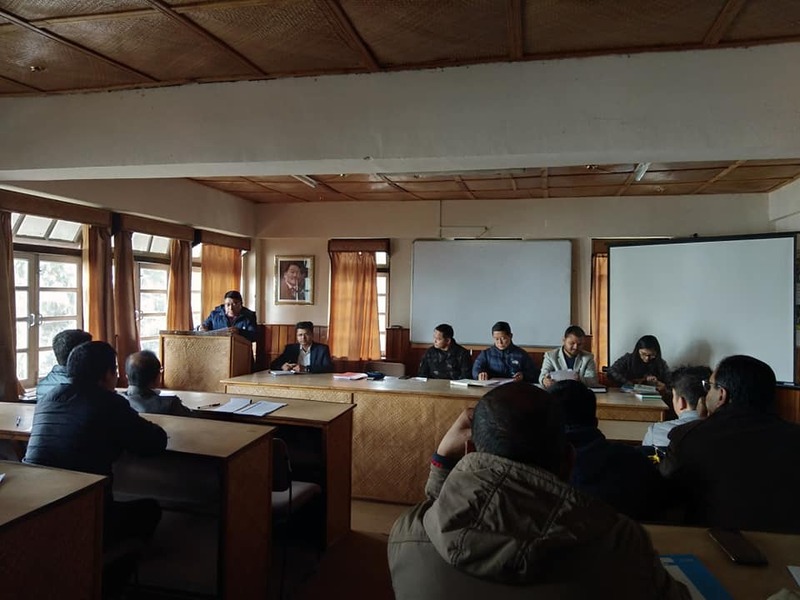 Gyalshing, 26 Feb (IPR): The First Round of Training for Assistant Expenditure Observer was conducted by the District Election Cell at DAC Conference Hall. The programme was chaired by District Collector, West, Dr. A.B. Karki, Additional District Collector, West, Shri Karma Lodey Lepcha, Sub Divisional Magistrate, West, Shri Tushar G. Nikhare, SDM, Yuksam, Dr. Sonam R. Lepcha, and Accounts Officer, Human Resource Development Department, Shri Ashap Sharma. Deputy Chief (Pay & Accounts), Shri K.B. Subba, was the master trainer for the programme wherein he explained all the necessary procedures to be followed by the AEOs during the time of elections. The training was mainly for the AEOs and their supporting staffs. Accounts Officer, HRDD, Shri Ashap Sharma, has been appointed as Nodal Officer for Election Expenditure Monitoring. It may be recalled that the first round of training for Sector Magistrates, Flying Squad, Static Surveillance and Video Surveillance Teams was also conducted on 21st February, 2019 at the Zilla Conference Hall in Kyongsa. The Sector Police officers were also trained and appointed by Superintendent of Police, West. A total of 21 names have been selected for the Sector Magistrates, 08 teams each for Flying Squad, Static Surveillance, Video Surveillance and 01 Nodal Officer as informed by the ADC (W). Gangtok, 26 Feb (IPR): The National SC-ST Hub Conclave, an initiative of the Ministry of MSME, Government of India was held today at Chintan Bhawan. 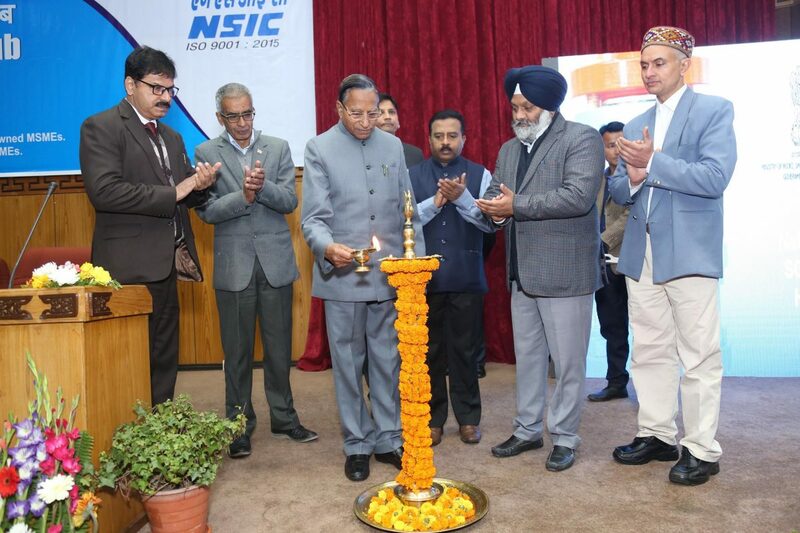 Hon’ble Governor Shri Ganga Prasad attended the event as chief guest. Present at the conclave were Mayor, Gangtok Municipal Corporation, Shri Shakti Singh Choudhary, Principal Secretary, Commerce & Industries Department, Dr. Thomas Chandy, National Working President of Forum of SC and ST Legislatures & Parliamentarians & Director General of Dr. Ambedkar Chamber of Commerce, Mr. Inder Iqbal Singh Atwal, Director (P&M), NSIC, Head Office, New Delhi, Mr. P. Udaya Kumar, Additional Secretary, Ministry of Food Processing, Government of India, Dr. Rakesh Sarwal, and Zonal General Manager, NSIC (North-East), Dr. Avinash Choudhary. The Governor, in his address, expressed his happiness and gratitude for inviting him as the chief guest, stating that for a developing economy like India, it was of utmost importance to have an interactive gathering of entrepreneurs and investors for development that is inclusive of all. “Sikkim has already made its mark in the Organic sector so it is both sensible and valuable to expand its organic market and grow globally,” said the Governor. He praised the State Government for providing beneficial schemes to the public that has helped a consumer become a producer thereby uplifting various sections of the society. He stressed on making maximum utilization of products like bamboo that can be marketed extensively and encouraged the youth to be confident and innovative, both. He ended his note stating that in order to be capable, one needs to empower themselves with skill and knowledge and advised that entrepreneurs make optimum use of the benefits and schemes provided by the government. Principal Secretary, Commerce & Industries Department, Dr. Chandy, spoke on the benefits of various schemes for budding entrepreneurs, stressing particularly on the history of traditional arts and crafts that is unique to Sikkim. He mentioned the Directorate of Handicrafts and Handlooms that has existed since the monarchy and said that with time and development, necessary marketing and investment is the need of the hour to take the industry forward. He also talked about livelihood schools that cater and hone the skills of youngsters so that they become skilled craftsmen and entrepreneurs. Adding to that, he mentioned that various banks provide loans that can financially aid a business venture and that budding entrepreneurs should take advantage of this. He advised people to be proactive and stated that incubation centres with technological interventions along with marketing support and market information would enhance every commercial venture. He further said that comprehensive information with collaboration between the Ministry and State Government and all public-private sectors would be of great help in disseminating awareness thus expanding the market. Dr. Chandy concluded his address saying that the existing capacity should be in proportion with the capacity that is sourced from outside so that the schemes and benefits are packaged accordingly for the enhancement of skills for the entrepreneurs. 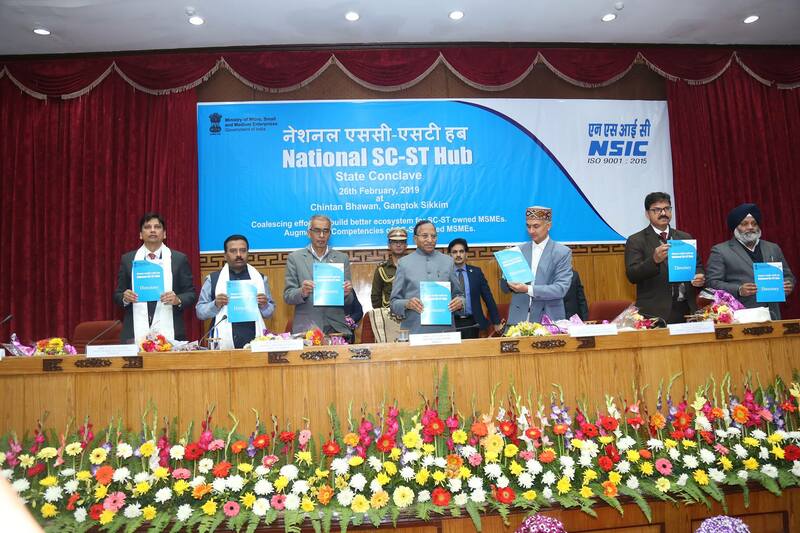 Earlier, Director (P&M), NSIC, Head Office, New Delhi, Mr. Kumar, briefed the gathering on the importance of the SC-ST hub and its necessity for growing entrepreneurs, particularly in the North East region. He mentioned some of the key initiatives of the NSIC and encouraged all to turn into job providers instead of job seekers. The second half of the session had presentations on the different schemes of MSME-DI (Government of India), KVIC (Government of Sikkim), NSIC (North East), Department of Industries (Government of Sikkim), FCI (Sikkim), Power Grid Corporation of India and the National Hydro Electric Power Corporation Ltd. The final session included presentations from various banks like the Branch Indian Overseas Bank, SBI (Gangtok), NEDFI (Gangtok), NABARD (Gangtok) and the Central Bank of India.